By using Adobe Creative Suite 5 (Adobe CS5) Illustrator rather than Photoshop, you gain several benefits. You may have heard that Illustrator is better for vector graphics, but why and what else does it bring? Illustrator can save and export graphics into most file formats. By choosing to save or export, you can create a file that can be used in most other applications. For instance, Illustrator files can be saved as .bmp, .jpg, .pdf, .svg, .tiff, and even .swf (Flash) files, to name a few. Illustrator files are easily integrated into other Adobe applications. You can save Illustrator files in their native format and open or place them in other Adobe applications such as Dreamweaver, Fireworks, Flash, InDesign, and Photoshop. You can also save Illustrator artwork in the .pdf (Portable Document Format) format. It lets anyone using the free Acrobat Reader software open and view the file but maintain editing capabilities when the file is opened later in Illustrator. Illustrator artwork is reusable because the resolution of vector artwork isn’t determined until output. In other words, if you print to a 600 dpi (dots per inch) printer, the artwork is printed at 600 dpi; print to a 2,400 dpi printer and the artwork prints at 2,400 dpi. Illustrator graphics are quite different from the bitmap images you create or edit in Photoshop, where resolution is determined as soon as you scan, take a picture, or create a new bitmap (created from pixels) document. You can create vector artwork in Illustrator and scale it to the size of your thumb or to the size of a barn, and either way, it still looks good. Vector graphics are made up of lines and curves defined by mathematical objects called vectors. Because the paths (the lines and curves) are defined mathematically, you can move, resize, or change the color of vector objects without losing quality in the graphic. Vector graphics are resolution-independent: They can be scaled to any size and printed at any resolution without losing detail. On the other hand, a predetermined number of pixels create bitmap graphics, so you can’t scale (resize) them easily — if you scale them smaller, you throw out pixels; if you scale them larger, you end up with a blocky, jagged picture. 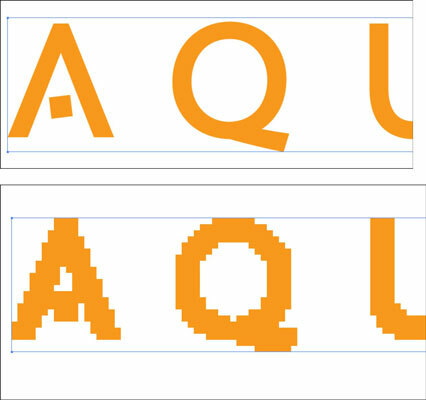 The following figure shows the differences between an enlarged vector graphic (top; notice the smooth edges) and an enlarged bitmap graphic (bottom; note the jagged edges). Many company logos were created as vectors to avoid problems with scaling: A vector graphic logo maintains its high-quality appearance at any size.